Get professional help from an advisor with over 25 years experience! 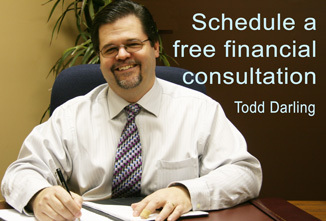 Todd Darling is licensed with Portfolio Strategies Corporation, through which mutual funds are distributed. Provisus Wealth Management, Transcend offers affluent investors (min $150,000 net assets): professional money management, customized portfolio construction, investment manager selection and more. Are You Protecting What Matters? Have You Ever Asked Yourself: If I was unable to work due to illness or disability, how long could I live off my current finances? . . . If I (as a business owner) lost my partner(s) or key employee suddenly, what would it cost the business to replace them? . . . Will I have enough money when I turn 60 or 65, to retire on for the next 20+ years? . . . If I died tomorrow, could my spouse and family maintain their current lifestyle? . . . If I died tomorrow, how much of my estate would go to the government for taxes? . . . Will my family be able to pay estate taxes? If you are concerned about these questions, we would love to help! Money doesn't need to be scary. A Financial Plan, includes your personal list of short and long-term goals, and how you’re going to spend (and save) your money to achieve those goals. It makes your money manageable. feels amazing. Come talk to us!